Project: Dead End is a development blog where I am chronicling the process of game design from initial concept through publication. My regular game group meets on Wednesday evenings. We used to playtest designs regularly, but I found my creativity sapped these past few years due to starting college, and changing careers. Well, I’ve graduated, and work is great so suddenly my desire to create has returned. This past Wednesday (Feb 1, 2012) I brought out the first new prototype that we’ve tried in a while. The codename for this new project is “Dead End.” It is a zombie themed card game that is intended to be quick, light, and fun. This is how my projects begin. 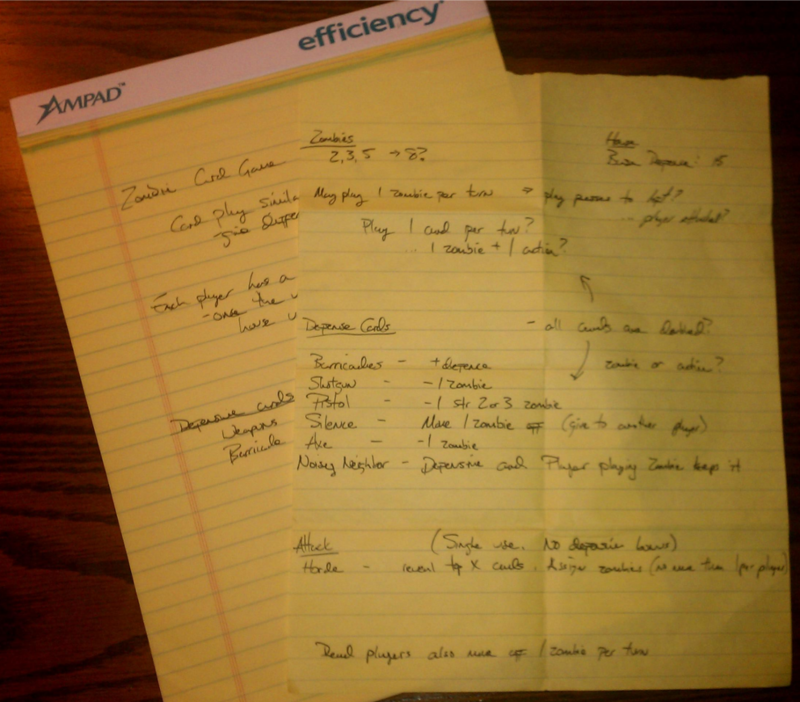 A few scratch notes on a yellow notepad sets the ball in motion. I have tried maintaining notebooks. I have tried taking notes electronically. 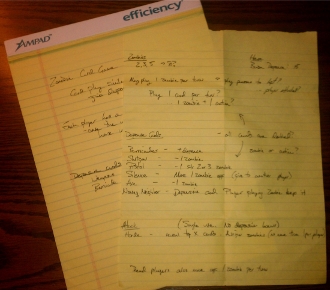 I have tried to maintain a “file.” Nothing has worked for me creatively like a plain yellow notepad. When I start a design, I generally just have a few ideas. For this one, I wanted it to be about zombies and I wanted there to be a possibility that everyone loses. Developing on that idea, I have placed the players in their homes around a cul-de-sac when the approaching doom begins. The players have fortified their homes and must attempt to be the last survivor. That’s about it for my first note taking session. I had a ton of ideas for various things, but at this point, I just let things stew around in my head for a while. I find that I solve problems better when I am not actively thinking about them, so I let everything just work itself out in thoughts. This process might not be efficient, and I very well might let great ideas go while cultivating bad ones, but it’s my process and it works for me. Over the next few weeks I developed various ideas. I wanted players to play zombies on their opponents while also being able to kill zombies that have been played on them. I also wanted players to “die” but I hate player elimination. So, why not let players that “die” become zombie players that attempt to kill off the survivors? I like that! So, I’ve introduced the idea that the players can all lose and the zombies can win, but don’t be fooled, this is no co-op. After I think I have something in my head that I want to try, I start putting it in writing. I’m not talking about writing out a set of detailed rules, I’m just trying to facilitate the design process with committed ideas. This is when I work on things like card types, powers, hand size, play limits… all the “nuts and bolts” of the design. Initially I had imagined that there would be zombie cards and action cards. Players would play zombies on their opponents and actions would either help them or further hinder their opponents. I realized when writing things out though that if a player got turned into a zombie, all those action cards would be useless to them. I don’t like having useless things. Why not have the cards do both? The action cards could also be zombie cards. This gives the player a decision to either play the card to help themselves or to further hinder their opponent. I like this! This is where my prototypes start. I have had various jobs in the past that have provided me with an abundance of business cards. These things make great cards for game design! I can write on them, scribble on them, draw on them and I always have plenty of extras for adding new cards or changing the design. I didn’t sit down and write these out until an hour or so before game time. I wanted to test out the various event cards so I went a little overboard with the total number of each card. I also wanted to have cards that were just zombies. This adds a bit of hand management into the game because it opens up the action cards a little instead of constantly playing them as zombies. 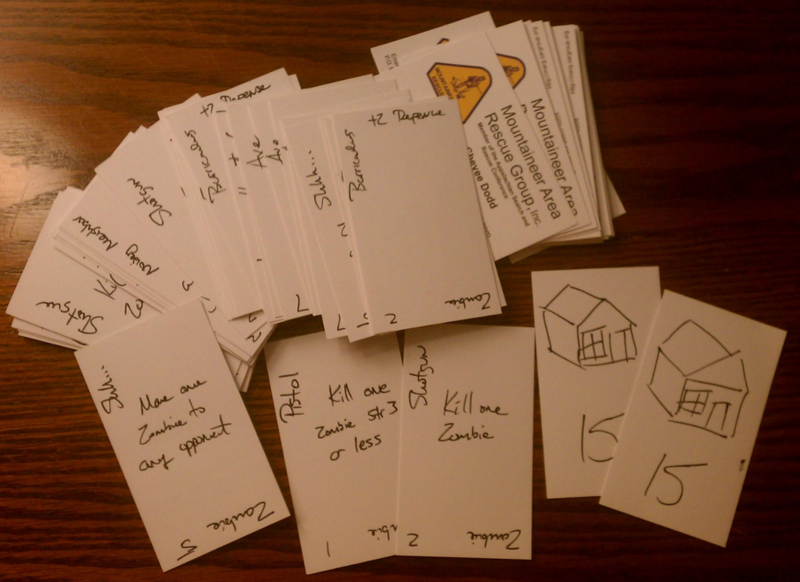 While writing all these cards, my friend John says, “why don’t you have zombies that do things?” I had cultivated this idea once, but it struck me as brilliant in that moment. Sure. Let’s try that! So now we have zombies that break down barricades and zombies that can’t be killed with an axe. I have a deep feeling that this first prototype is wildly broken and I am absolutely correct. Our first playtest session didn’t reveal any inherent mechanics that are flawed, just the power level of the cards compared to the defensibility of the houses. This is when the “fun” starts. The game is not broken beyond repair, it just needs tuned. The number of action cards needs turned down. The strength of zombies needs adjusted. The base defense of the house needs tweaked. A few things need removed. A few things need added. Some rules need adjusting. That’s all. Not a bad start really. I hope this wasn’t too vague and boring for those of you that made it all the way through. My next post will involve a detailed description of the first iteration as well as a full description of the second version. My plans are to make this game as “open source” as possible, allowing anyone that wants to try it at any stage of the process to make their own version and give it a go. Stay tuned!